Roberta E. Krusemark, 95, of Lincoln, formerly of Emden, passed away at 9:45 a.m. Wednesday (Oct. 17, 2018) at Abraham Lincoln Memorial Hospital, Lincoln. She was born May 31, 1923, in Lincoln, to Ray and Susan Irwin Staats of Beason. She married Harold “Boyce” Krusemark on April 21, 1951, in Beason, and he survives. Also, surviving are two sons, Jim Krusemark, Peoria, and Lynn Krusemark, Manchester, Mo. ; one daughter, Karen (Rich) Yocius, Libertyville; six grandchildren, Molly Krusemark, Andrew (Betsy) Krusemark, Jessica Perolio, Erika (Alan) Krusemark, Richard Yocius and Mark Yocius; three great-grandchildren. She was preceded in death by her parents and one brother, Lyle Staats. She started her 28-year teaching career in one-room schools at Tabor and Rosedell country schools in DeWitt County. She also taught in Chestnut Elementary School, and last taught at Hartsburg-Emden Elementary School. 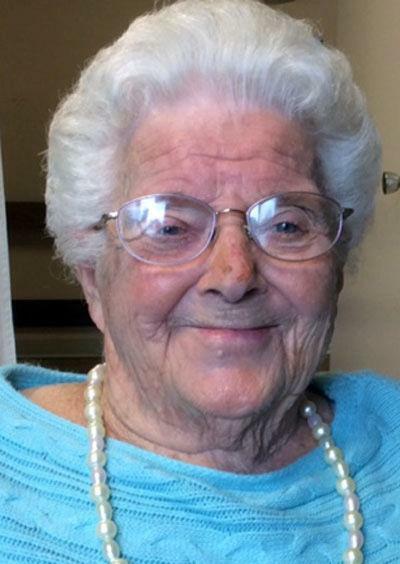 She was a member of the St. Peter Lutheran Church in Emden and its Ladies Aid Society, Emden American Legion Auxiliary Post 506, Logan County 4-H, rural youth of Logan County and a longtime member of Central Illinois Card Club. Roberta loved baking, cooking, sewing, gardening, camping, fishing and playing cards. Her funeral will be at 11 a.m. Monday at St. Peter Lutheran Church, Emden. Pastor John Schurter and Ryan Edgecomb will officiate. Visitation will be from 1 to 3 p.m. Sunday and one hour before the service, both at the church. Burial will be at Bethel Cemetery, Emden. Davis-Oswald Funeral Home, Delavan, is handling the arrangements. Memorials may be made to St. Peter Lutheran Church or Christian Village in Lincoln. To express condolences, visit www.davisoswaldfh.com.